Well, how else should you spend your last hours in Africa, but kissing a giraffe and patting baby orphan elephants? So I went with Gracepatt Ecotours out, first of all, to the Giraffe Centre on the outskirts of Nairobi. Here they breed Rothschild giraffes and release them to national parks. 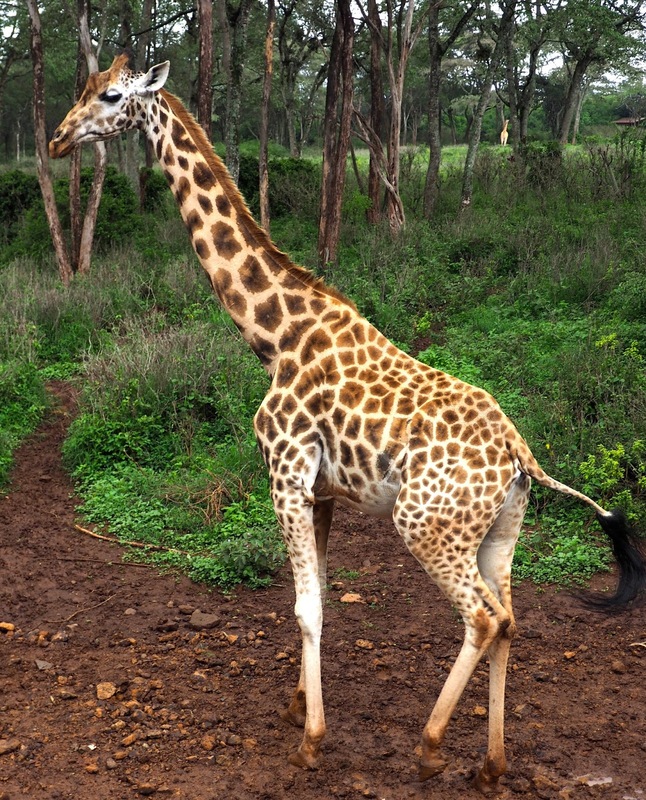 There are 3 sub-species of giraffe in Kenya, and this one, found only in this country, was nearing extinction, down to 130 individuals because of habitat loss. Then Jock and Betty Lesley-Melville stepped in and began their rescue in 1979 - it's not over yet, there are still only 300 of them, but the future's looking pretty good. If you're wondering, you can pick them by their white stockings. Equally important, as ever, is education, especially of young people: about the environment, wildlife, and its importance to Kenya - as well as its right to live here. So there are well-informed guides at the centre handing out molasses-cereal pellets to hand- (or mouth-) feed the giraffes, and telling everybody all about them and what extraordinary creatures they are. Necks the same length as their legs, did you know? Same number of neck vertebrae as we have. Tongues 46cm long - and blue. The thing to do here is to hold a pellet in your lips and wait for the giraffe to take it. There are whiskers and a bit of spit, but it's a gentle process. Step back fast once the food is gone, though, or you'll get head-butted. Next we went to the David Sheldrick Wildlife Trust to get up close with orphaned baby elephants - so, naturally, cuteness overload. For an hour a day, you can go in and watch while 32 eles are brought up close and each fed big bottles of lactose-free baby formula. We stood behind a flimsy rope and watched them trotting eagerly out of the trees, in two groups, rushing up to the keepers to get their feed (every three hours, 24 litres each in total) and not always happy once the bottles were empty - there was a bit of irritated trumpeting going on. Then they wandered around, playing with each other, picking at leaves, messing with the water in a trough, and frequently close enough to the rope for us all to give as many pats as we wanted. There was a bit of inter-elephant pushing and shoving, and we sometimes had to leap backwards not to get trodden on, but it was a lovely experience. The head keeper gave a detailed history of each of the orphans - name, age, how it ended up here (some mothers poached or dead of drought, a surprising number rescued from wells, a bit of human interference) and lots of other information, as well as an impassioned plea to avoid buying anything that could encourage more poaching. The babies are all re-introduced to wild living once they're old enough, but it can take five years to establish them with a new herd. Though it was sad why they were here, it was really lovely to see them, especially up so close, to touch them and look into their eyes, and recognise what unique and special animals they are. It was also pretty unique to run into the New Zealand Scrabble Team there, in Nairobi for the biennial international championships. A Kiwi has, uniquely, won it three times in the past, know that? But this year's winner of the $20,000 prize was from Bahrain. The competition games are always one-on-one, by the way. Far too hard, with more players, to remember what tiles are still to be played. Then Stephen, my chatty driver, took me back to the hotel - city street vendors wandering along the stationary lanes of traffic offering drinks, snacks and bananas, but also ties, tea towels, chef's hats, inner tubes and framed paintings - to have a final Tusker beer with the last of my Kenya shillings before heading out to the airport for tonight's long journey home. On the way there, stuck in some of Nairobi's dreadful traffic on a dual carriageway with four lanes nose-to-tail on both sides, was Africa's last surprise: a herd of cattle calmly grazing on the central reservation.